Fitch Ratings-Colombo/Singapore-14 June 2018: New capital-adequacy regulations for Sri Lankan finance companies are likely to improve the resilience of the sector to economic shocks, but will add to capitalisation pressures – particularly for the country’s numerous small-scale finance companies, says Fitch Ratings. Fitch-rated finance companies are unlikely to face immediate rating action, as we believe they all have adequate capital to meet the thresholds that will apply from 1 July 2018 – even after taking account of potential RWA changes, based on the current asset mix – and most already comply with the 1 July 2021 thresholds. However, future rating action will take into account finance companies’ ability to meet the higher minimum requirements over the next few years. It is possible that some will require external capital to support loan growth and stay in compliance with the higher requirements. Smaller finance companies had already been struggling to raise capital to comply with an earlier requirement that each finance company hold a minimum core capital of LKR2.5 billion by 1 January 2021. The new minimum capital ratios are likely to add to those difficulties, although the lack of regular disclosures compared with banks prevents us from assessing in full the likely impact on individual finance companies. The minimum Tier 1 ratio will increase from 5% to 6% for all finance companies on 1 July 2018, and then rise to 8.5% by 1 July 2021, with incremental increases each year. The minimum total capital ratio will also increase steadily. 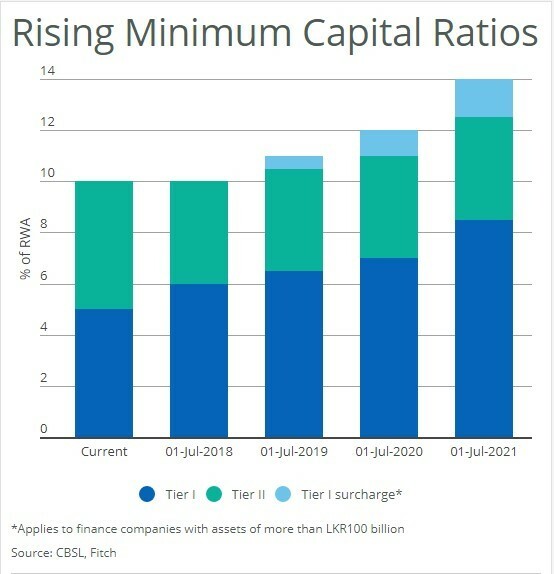 Additional capital surcharges for finance companies with assets of more than LKR100 billion will be introduced on a staggered basis from 1 July 2019, and will reach 150bp by 1 July 2021 (see chart). Meanwhile, capital ratios will come under downward pressure from changes to the calculation of risk-weighted assets (RWAs) to bring the framework further into line with the recommendations of the Basel committee. The changes will substantially increase RWAs, stemming mainly from additional of risk weighting for ‘operational risk’ and changes in the computation of RWA for credit risk. Finance companies that are highly exposed to uncollateralised lending to retail borrowers – such as microfinancing – may see the sharpest increases in RWAs, as this lending will be risk-weighted at 125% instead of 100% previously. However, the new RWA methodology does not include market risk – unlike for banks – which the regulators view as low in this sector. The document setting out the new capital regulations categorises finance companies with more than LKR100 billion – those facing the additional surcharge – as “domestic systemically important licensed finance companies (D-SILFCs)”. However, we do not believe that this means the authorities consider these companies to have the same systemic importance as “domestic systemically important banks (D-SIBs)”. Accordingly, we continue to see the propensity for sovereign support for Fitch-rated finance companies as very low. Copyright © 2018 by Fitch Ratings, Inc., Fitch Ratings Ltd. and its subsidiaries. 33 Whitehall Street, NY, NY 10004. Telephone: 1-800-753-4824, (212) 908-0500. Fax: (212) 480-4435. Reproduction or retransmission in whole or in part is prohibited except by permission. All rights reserved. In issuing and maintaining its ratings and in making other reports (including forecast information), Fitch relies on factual information it receives from issuers and underwriters and from other sources Fitch believes to be credible. Fitch conducts a reasonable investigation of the factual information relied upon by it in accordance with its ratings methodology, and obtains reasonable verification of that information from independent sources, to the extent such sources are available for a given security or in a given jurisdiction. The manner of Fitch’s factual investigation and the scope of the third-party verification it obtains will vary depending on the nature of the rated security and its issuer, the requirements and practices in the jurisdiction in which the rated security is offered and sold and/or the issuer is located, the availability and nature of relevant public information, access to the management of the issuer and its advisers, the availability of pre-existing third-party verifications such as audit reports, agreed-upon procedures letters, appraisals, actuarial reports, engineering reports, legal opinions and other reports provided by third parties, the availability of independent and competent third- party verification sources with respect to the particular security or in the particular jurisdiction of the issuer, and a variety of other factors. Users of Fitch’s ratings and reports should understand that neither an enhanced factual investigation nor any third-party verification can ensure that all of the information Fitch relies on in connection with a rating or a report will be accurate and complete. Ultimately, the issuer and its advisers are responsible for the accuracy of the information they provide to Fitch and to the market in offering documents and other reports. In issuing its ratings and its reports, Fitch must rely on the work of experts, including independent auditors with respect to financial statements and attorneys with respect to legal and tax matters. Further, ratings and forecasts of financial and other information are inherently forward-looking and embody assumptions and predictions about future events that by their nature cannot be verified as facts. As a result, despite any verification of current facts, ratings and forecasts can be affected by future events or conditions that were not anticipated at the time a rating or forecast was issued or affirmed. The information in this report is provided “as is” without any representation or warranty of any kind, and Fitch does not represent or warrant that the report or any of its contents will meet any of the requirements of a recipient of the report. A Fitch rating is an opinion as to the creditworthiness of a security. This opinion and reports made by Fitch are based on established criteria and methodologies that Fitch is continuously evaluating and updating. Therefore, ratings and reports are the collective work product of Fitch and no individual, or group of individuals, is solely responsible for a rating or a report. The rating does not address the risk of loss due to risks other than credit risk, unless such risk is specifically mentioned. Fitch is not engaged in the offer or sale of any security. All Fitch reports have shared authorship. Individuals identified in a Fitch report were involved in, but are not solely responsible for, the opinions stated therein. The individuals are named for contact purposes only. A report providing a Fitch rating is neither a prospectus nor a substitute for the information assembled, verified and presented to investors by the issuer and its agents in connection with the sale of the securities. Ratings may be changed or withdrawn at any time for any reason in the sole discretion of Fitch. Fitch does not provide investment advice of any sort. Ratings are not a recommendation to buy, sell, or hold any security. Ratings do not comment on the adequacy of market price, the suitability of any security for a particular investor, or the tax-exempt nature or taxability of payments made in respect to any security. Fitch receives fees from issuers, insurers, guarantors, other obligors, and underwriters for rating securities. Such fees generally vary from US$1,000 to US$750,000 (or the applicable currency equivalent) per issue. In certain cases, Fitch will rate all or a number of issues issued by a particular issuer, or insured or guaranteed by a particular insurer or guarantor, for a single annual fee. Such fees are expected to vary from US$10,000 to US$1,500,000 (or the applicable currency equivalent). The assignment, publication, or dissemination of a rating by Fitch shall not constitute a consent by Fitch to use its name as an expert in connection with any registration statement filed under the United States securities laws, the Financial Services and Markets Act of 2000 of the United Kingdom, or the securities laws of any particular jurisdiction. Due to the relative efficiency of electronic publishing and distribution, Fitch research may be available to electronic subscribers up to three days earlier than to print subscribers. Fitch Ratings, Inc. is registered with the U.S. Securities and Exchange Commission as a Nationally Recognized Statistical Rating Organization (the “NRSRO”). While certain of the NRSRO’s credit rating subsidiaries are listed on Item 3 of Form NRSRO and as such are authorized to issue credit ratings on behalf of the NRSRO (see https://www.fitchratings.com/site/regulatory), other credit rating subsidiaries are not listed on Form NRSRO (the “non-NRSROs”) and therefore credit ratings issued by those subsidiaries are not issued on behalf of the NRSRO. However, non-NRSRO personnel may participate in determining credit ratings issued by or on behalf of the NRSRO.